Farmers Blend.....Sumatra! Very different from the first blend released under the Farmers Blend label. That blend (Habano XL) was a distant cousin to our Red 760 Peacemaker...similar blend with added Ligero and a Medium+ w/r/t strength. This new cigar is a stand alone, brand new blend. An absolutely beautiful Sumatra wrapper. 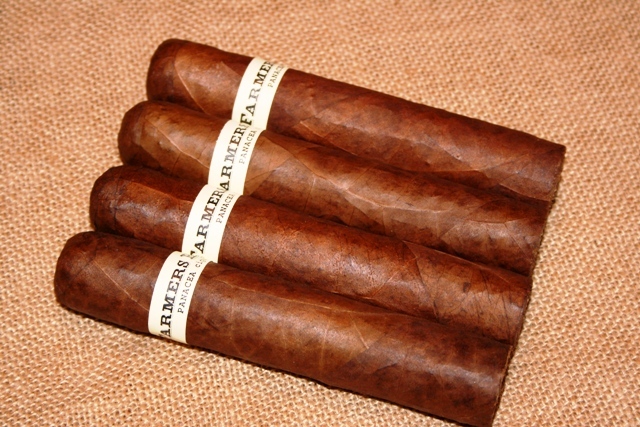 The filler is Pennsylvania strait strip, Nicaraguan Ligero, and 2 Dominican Ligeros. This Farmers Blend-Sumatra is a power house! By far the strongest offering from Flatbed Cigar Company to date. If you like strong, well balanced, large ring gauge cigars, this is the cigar you have been waiting for. It will not disappoint! After cutting this log with a chainsaw (only kidding), I lit this baby and enjoyed it for a very, very long time. Then again, I have never been disappointed with any Flatbed cigar. Appearance, construction, burn, and taste, all top notch. Keep up the good work Paul!